Prior to my trip to the Netherlands, I began my research from the USA learning about the history, culture, politics, and water infrastructure that has been developed through-out the country. I wanted to make the very most of the trip, and I knew that my time there was limited. I had scheduled appointments with as many folks as I could - all of whom I knew were involved with influencing and building upon the Dutch water culture. I quickly learned that my research had to be flexible and dynamic, and that meetings could occur spontaneously. A major component to my networking strategy was affiliating myself with my employer at the time (CBT Architects) as well as the BAC of which I graduated architectural school from, and the Urban Land Institute (ULI) of which I served as a member. It was these institutions and organizations that helped pave the way, allowed me to wear many hats in conversations, and established a bold network to build off of. I am grateful for this opportunity, and have taken advantage of every opportunity it has provided. Here is some of the initial research I was able to stumble upon. The Dutch have transformed the Netherlands into a water focused economy, driven by public policy, consensus, and an eagerness to become experts in water management around the world. The truth is, they literally had no choice, as their country lies in the low lands of Europe, which are susceptible to flooding from all directions - including the ocean, rivers, increased precipitation (the sky), and sinking land (water from the ground). On a personal level, I am impressed with their commitment to solving these water issues, and believe their experiments with building with water offers many ideas to urban environments and coastal communities. In a country that is less than twice the size of New Jersey of the United States, their keen instinct for global collaboration is what I believe drives their onslaught of water management success. Below is a film I found that summarizes how the Dutch have lived with water throughout their settlement history. Historically, the Netherlands has had its share of storm surge events and significant financial water related downfalls and investments. One of the biggest storms from the North Sea happened in 1953, which resulted in major infrastructure damage, 1 billion Dutch Guilders, and 1,836 casualties. The storm was so extreme that the Dutch had made a commitment to construct dykes and dams as part of a country wide effort to keep the water out. Today, there are approximately 14,000 km of dykes in the Netherlands. That is roughly the distance from the Netherlands to the South Pole of Antartica. In fact, the Dutch have re-constructed so much of their landscape, that little of it is natural today. Most of the original landscape that exists is above sea level. 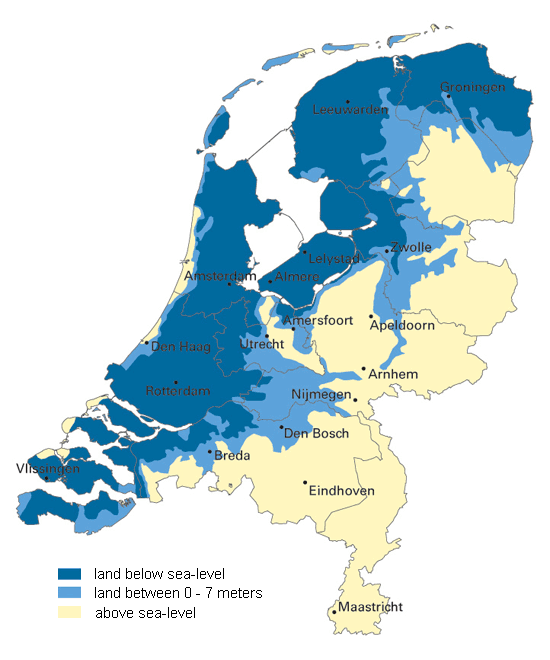 Below are some maps depicting land below sea level in the Netherlands as well as the regions protected by dykes. Below if a video I found which explains why the Netherlands is not under water. The Dutch recognize that leadership on water policy is important to the future of their country, and the threats and vulnerabilities of living with water is a dynamic battle. Willem Alexander, the King of the Netherlands, is considered an expert in Water Management and has specific interest in addressing international water management issues. The Dutch spend about 7 billion euro's annually to keep the water out of the low lands. This major investment employs over 20,000 people, all of whom manage and oversee 4,000 working pump stations. This work is all overseen by the Kingdom of the Netherlands, Ministry of Infrastructure and the Environment. In response to the natural disasters experienced in the Netherlands, the Dutch implemented a program called the Delta Works in 1958, which holds strong to the concept of "Living with Water / We are here to stay". This aggressive program called to construct a series of 13 dams in the south-western part of the Holland. Shortly after the projects were complete in the early 1960's there was a significant awareness movement from the environment. 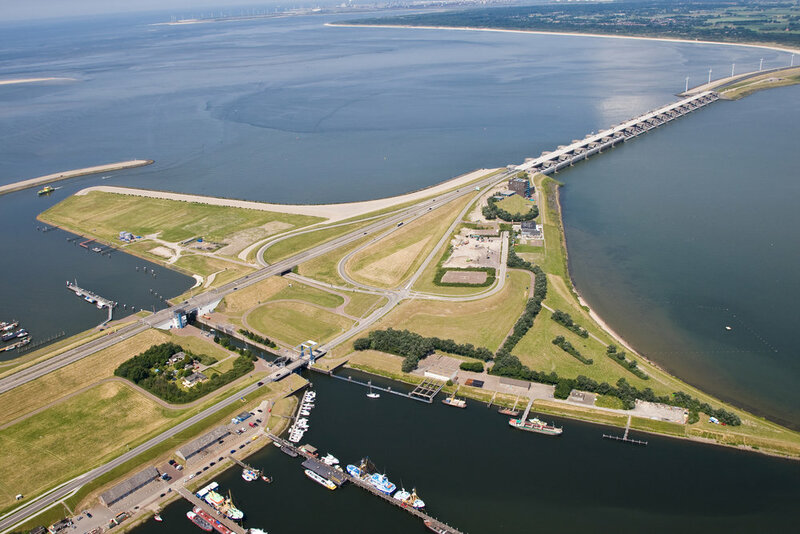 The construction of the dams seemed to have solved the short term flooding issue, however, the Dutch literally watched the ecological life along the rivers and harbor decline. Major environmental protests occurred, which included both scientific and fisherman protesting. This concluded that the dams were to remain open, and only close during extreme storm surge events. I have been fortunate to have visited 6 of them, and hope to return to see the rest in the future. To be most efficient with the limited time I had, and see as much of the Delta Works as I possibly could, I rented a car from Den Haag (the political capital of the Netherlands). I worked my way around the south western part of Holland, and witnessed some fascinating Dutch landscape and urbanism. From their well designed highways - including bicycling lanes and wind turbines, to their energy efficient vehicles, it was a trip to remember. I asked my friend, Diego Arias, to join me for this part of the trip, which made the drive even more fun, as we explored many aspects of the dams tectonic and engineering features. Oosterscheldekering is considered a civil engineering wonder of the world - this was a real privilege to see first hand. This storm surge barrier stretches between a few islands and is the largest dam of the Delta Works. It spans approximately 2.5 miles long, and protects the Netherlands from flooding from the North Sea. This barrier was built as a direct response to the North Sea Flood of 1953. The dam is constructed of huge sluice-gate-type doors which allow water to flow through. It takes about an hour to close the doors, and the operation costs are about €17 million per year. I was incredibly impressed by the scale of the dam, let alone the amount of water it can hold back at a given period. According to its operation, water must be about three meters above regular sea level before the doors are allowed to close. It is hard to imagine the amount of weight and volume of water this barrier can hold back - on top of the tidal movement it can withstand. Another impressive part of this barrier is that it doesn't just serve to keep the water out. This is a multi-purpose piece of infrastructure, acting as a storm surge barrier and bridge for automobiles, cyclists, and pedestrians. It also serves as a public beach, fishing destination, park, recreational space, camp ground, and meadow land among other things. The barrier has a visitor center and even a museum which discusses the construction of the barrier, the reason for it, and how it works. The museum also focuses on marine ecological life and aquaculture, and the importance of climate change. The Dutch are now creating spaces for ecological life to thrive along it. Below are some photos I took during my visit to Oosterschedekering and the Neeltjejans Delta Park. I hope to return in the future, and see how the Dutch have transformed this big project. Another fascinating project of the Delta Works that I was able to visit is the Maeslantkering Storm Surge Barrier which is located on the Nieuwe Waterweg. This barrier is controlled by a "supercomputer" and closes if the city of Rotterdam is threatened by flooding. 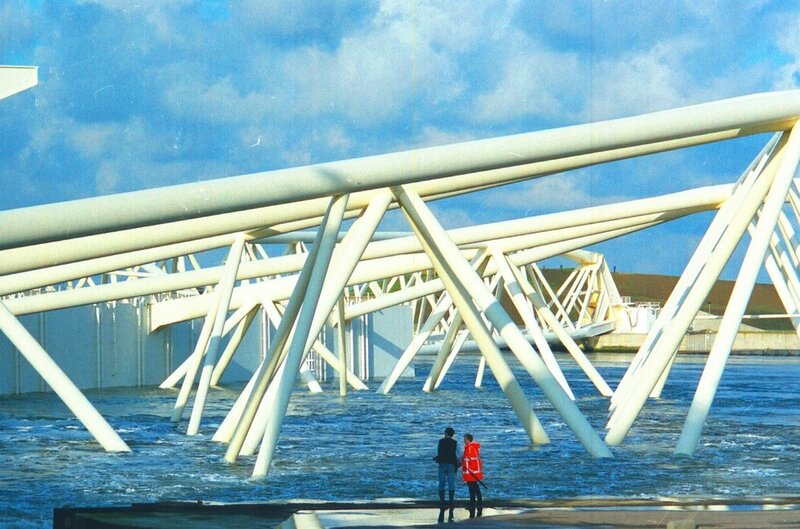 The Maeslantkering Storm Surge Barrier was considered the final stage of the Delta Works project, and the main objective was to improve the safety of flooding in the Rotterdam harbor. Each truss of the storm surge barrier gate is about the same size of the Eiffel Tower of Paris, France - and the project cost about 660 million euros. The barrier also includes a visitor center, which one can find the technical information about the project and its operation. 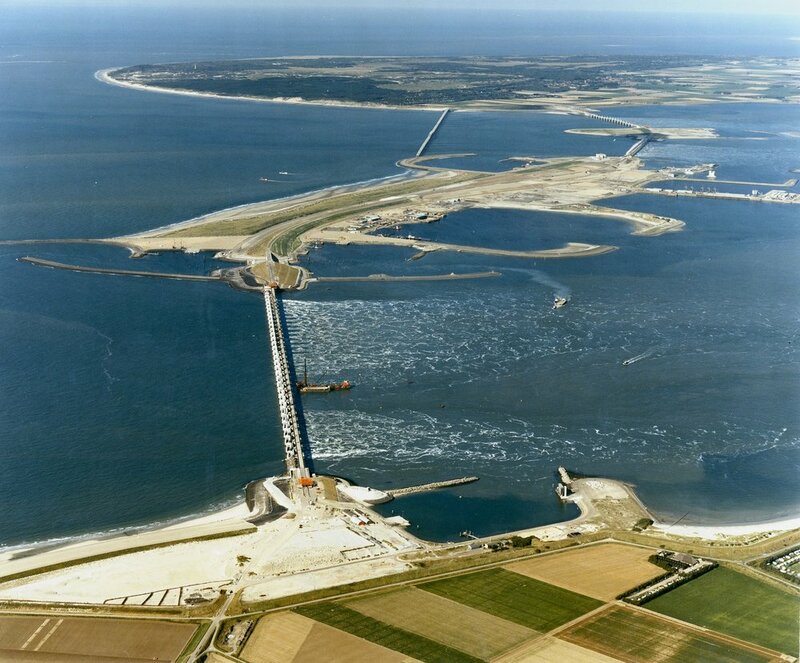 Haringvliet dam finished construction in 1971 and took the longest time to build in comparison to all of the other storm surge barriers of the Delta Works. What made the construction challenging was that it had to protect from flooding and also drain the Rhine and Maas Rivers into the North Sea. The dam always had to remain open during construction, so water could flow through. In order to preserve wildlife, a number of piers were constructed so fish could swim through them directly (even if the water locks are closed). I was impressed with the tectonic and structural nature of this dam. Below are some photos that inspired my thinking of this concept. Before the closure of the Haringvliet, it was a large nature reserve. The Haringvliet became a lake after the construction of the Haringvliet dam. The soil which was flooded during high tide was uncovered and was used by farmers. Consequently, many geese lost their habitat area. The tide change no longer influenced the flora and fauna. Many plants and animals that depended on the sea, died. Plants which were flooded for 12 hours during flood tide, dried up. The crabs and shrimps did not survive the transfer from a salty to a silt environment. The death of some sorts however meant the upcoming of others. Similarly, flounders and smelts were replaced by carps, perches and rock-basses. Nevertheless, the present balance was thoroughly disturbed in the years after the closure. There are many lessons to learn from the construction of these large barriers in the Netherlands. My general understanding is that the Dutch realize fighting the water is a losing battle. The more we try to control the water, the more it controls us. There is no economic win, other than to work with the flow of our river systems, and to move with the tide of our oceans. I have learned many lessons from the Delta works project, that I plan to apply in my professional career as an architect. 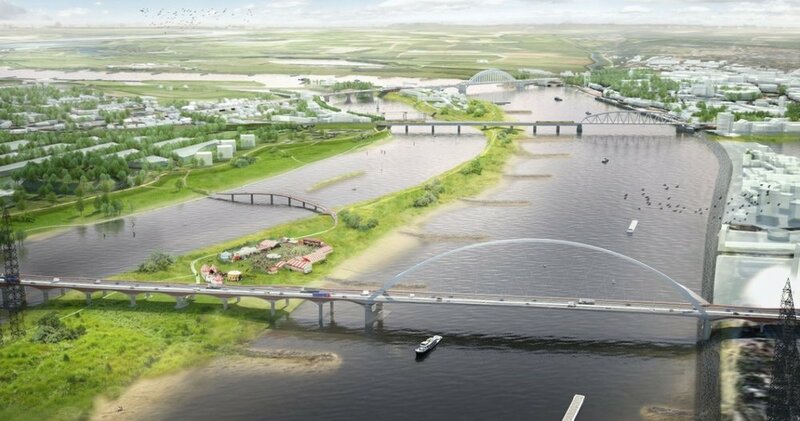 Making Room for the River is one of the most exemplary projects in the Netherlands that prioritizes natures systems, and focuses economic benefits on ecological ones. This project represents a country wide effort of systems thinking, and taking into account the predictions of climate change. This project sees the issues of water as an opportunity, and aims to thrive with it. I was able to connect with key visionaries of Making Room for the River including Jandirk Hoekstra and Dirk Sijmons of H+N+S Landscape Architects, as well as Henk Ovink of Rebuild by Design, and Rudy Stroink, who was the country chairman of the Urban Land Institute of the Netherlands. I learned of challenges that came along with the project, including the sacrifices that the Dutch people made to make it happen - which was not an easy hurdle to overcome. Making room for water, means giving up the land, and most people do not typically like to give up what they have, especially if it has been in their family for decades and multiple generations. It is my understanding that there was a benefit to giving up the land, and that the Dutch government would offer assistance for those willing to relocate for the betterment of the country. To me this project is about ultimate flexibility, and understanding that we live in a world that is extremely complex and dynamic. Cities that are dealing with water issues have a lot to learn from this project, and I look forward to visiting this again in the future. Below is a short film that describes the project, how it works, and how much space is being created for the water. Below are some photos I was able to take during my visit - I was impressed by the scale of this project, and the thriving ecology life that is expanding from the growing river. A major part of my field research began in Amsterdam, surrounded by over 100 kilometers of canals. I was fascinated with the amount of water that flows through the city, and how the Dutch embrace every moment of it or so it seems to me. These canals are also managed by the Kingdom of the Netherlands Ministry of Infrastructure and the Environment. Maintenance is a constant upkeep, and the canals are used seasonally throughout all weathering conditions. I worked closely with the Academie van Bouwkunst, and particularly the director, Aart Oxenaar. Aart introduced me to many faculty and students at the academy - including Machiel Spaan of M3H Architecten, Marit Janse - a recent graduate of the academie, as well as the dean of Landscape Architecture, Marieke Timmermans - all whom have opened many doors and pointed me in the right direction for the first few phases of my research. I started my research with an open mind. I knew there was a lot to learn, so my thinking process was that all information was good information. I also knew in the end, I would have to summarize my findings in the form of a lecture series and/or a publication - so this motivated me to document my research rigorously. I had initially read a few books that equipped me with a general understanding of Dutch policy for dealing with water issues. I knew the people I wanted to interview, as well as some of the places I needed to see and visit - but I certainly didn't turn down a recommendation from a local Dutchman. First step was finding my mode for transportation: so I bought a bike for 30 euros on the street (I certainly hope it wasn't stolen!). The brakes barely worked, and there were no headlights, but I knew it could take me where I needed to go. For those of you whom have been to the Netherlands, it is easy to recognize that cycling is a popular form of transportation. There are actually more bicycles than people in the Netherlands - which is quite interesting considering it is one of the most densely populated nations in Europe. Perhaps this contributes to the country's successful measure of happiness compared to other countries around the globe. The Dutch have seemed to mastered the art of parking a bicycle in basically any location. One of the first recommendations of exploration I received from a few folks from the Academie was to take a bike ride from Amsterdam to Marken. Aart Oxenaar was quite keen on the trip, and mentioned I would see many aspects of Dutch Water Management along the way. This short trip turned out to be one of my most memorable experiences in the Netherlands, and I found myself fully immersed in many aspects of Dutch water culture - including modern movements of water transportation and historic settlements of flood protection. Biking north through the canals of Amsterdam led me to the Amsterdam Veer Centraal Station and eventually the Ferry Terminal, which offered free ferry trips every 15 minutes across the IJ River to Overhoeks, a newer and upcoming district of Amsterdam-Noord. Biking through the polder-land is fascinating, the Dutch landscape is diverse in agriculture, and flood protection from summer dijks and winter dijks protect the land through-out the different seasons. Farm land and cattle grazing, is a major part of the Netherlands GDP, and it is a cultural experience to see this beautiful landscape. But one of the most interesting experiences was riding on top of the dijks, and over looking the houses that are below sea level. Maintaining the polder land from saline intrusion and pumping the water out of the region is a big task to undertake. If you find yourself in Amsterdam searching for a pleasant bike ride, I highly recommend this one, as I think it offers a lot of diversity for of the Dutch landscape. Below are some photos of the dijks, the houses susceptible to flooding, and the various types of agricultural life that exists throughout that I was able to see along the way. As I was riding around the city, I couldn't help but also notice the amount of house boats that floated along the canals. They were quaint and elegant, and I was eager to learn more about them. There are over 4,000 floating structures in the Netherlands - including floating hospitals, housing, jails, schools, bridges, you name it they have basically built it on the water. Amsterdam is known for its house boats, which can be found along the numerous canal streets. I actually got a tour of one of them - I was so curious, a local Dutchman just asked if I wanted to take a look at his newly renovated house boat. He then explained to me how he receives electricity, plumbing, cable, etc. through a flexible tubing system. He also gave me a book on house boats in the Netherlands. I was humbled by his warmth and hospitality. Rotterdam has one of the highest standards for living with water in the world. From protection against flooding, to safety and evacuation planning, the Dutch are constantly building solutions to combat climate change. The city is planning for many solutions to deal with increased precipitation, coastal flooding from storms, sea level rise, and extreme heat.